HomeLifestyleHealthAerosols and Ebola How Far Can Ebolavirus Spread? 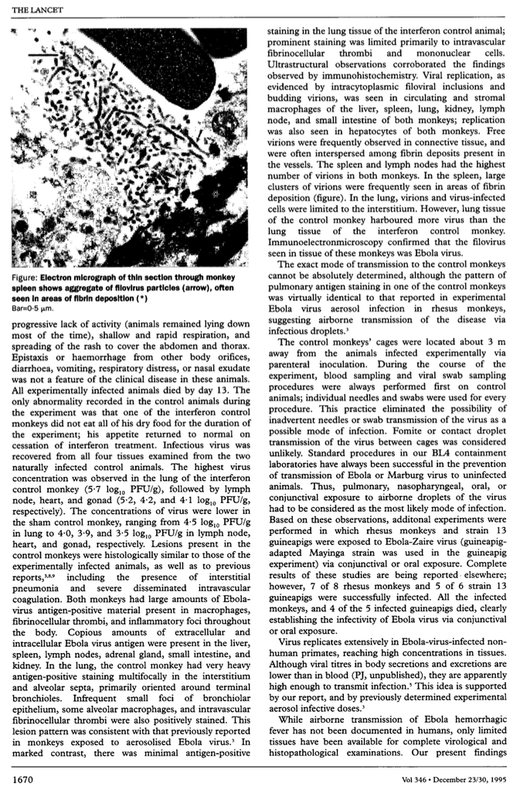 In searching for information on Ebola, I happened to find this rather old (1995) article on the transmission of Ebola (Zaire), the species of Ebola that is responsible for the current outbreak in Africa and the cases in North America. 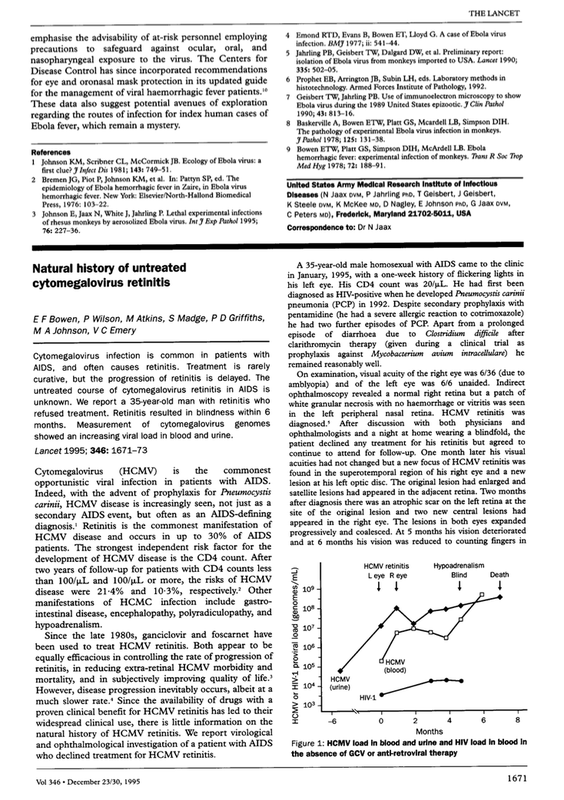 The article by Dr. N Jaax, a veterinarian and his colleagues, was released December 1995 in "The Lancet", a renowned medical periodical, and provided a glimpse of how the Ebola virus could be transmitted through the air, a contrast to the widely held and much propagated theory that Ebola is spread only through direct contact with an infected person's bodily fluids. The authors begin by noting that the the route of infection for human filovirus exposures is unknown. As we've been repeatedly told, close contact with vomit, blood, diarrhea, tissue and improper medical hygiene are the main routes by which Ebola spreads from person to person. The importance of aerosols, a system of liquid or solid particles that are suspended in air, has been little studied in the transmission of Ebola. 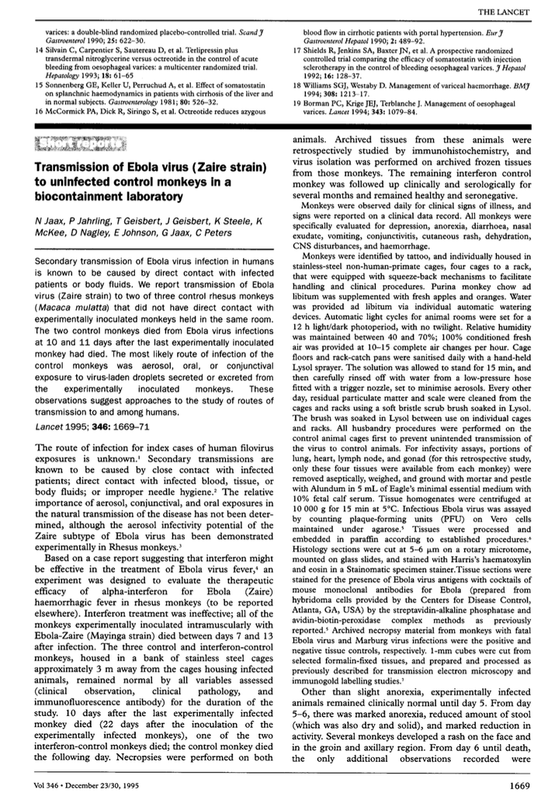 The authors reported that a secondary transmission of Ebola took place in a laboratory where both experimentally infected and non-infected (the control group) rhesus monkeys were held. The monkeys were part of an experiment that was design to evaluate the therapeutic value of alpha-interferon in the fight against Ebola (Zaire). The two groups of monkeys had no physical contact with each other, in fact, they were housed in stainless steel cages located approximately 3 metres or 10 feet from each other. The first of the inoculated monkeys died 7 days after infection and the last died 13 days after infection. At that point, the control group monkeys appeared to be entirely normal with no signs of hemorrhagic fever. Two of the three control monkeys became infected and died from the Ebola virus; the first died 10 days after the last experimentally infected monkey died (22 days after the inoculation of the experimentally infected monkeys) and the second died the following day. Necropsies showed that the control monkeys had large amounts of Ebola virus present throughout their organs, including the liver, spleen, lymph nodes, adrenal gland, small intestine, kidneys and lungs. The scientists involved were extremely cautious about the procedures used during this experiment; cages were cleaned using Lysol and low-pressure water to minimize the creation of aerosols. All cleaning procedures were carried out first on the cages containing the control animals to ensure that the Ebola virus was not inadvertently transmitted to them. As well, all blood testing and viral swab sampling were performed first on the control monkeys, again, to ensure that there was no cross contamination. The laboratory procedures used in this experiment had been used by the same lab in other experiments and had successfully prevented the transmission of Ebola and Marburg viruses to uninfected animals. "The exact mode of transmission to the control monkeys cannot be absolutely determined, although the pattern of pulmonary (lung) antigen staining in one of the control monkeys was virtually identical to that reported in experimental Ebola virus aerosol transmission of the disease via infectious droplets. Given my previous posting on the airborne spread of Ebola over a 15 centimetre or 6 inch gap between infected and non-infected laboratory animals, I found it rather stunning that nearly 20 years ago, scientists had observed that Ebola (Zaire) appeared to spread over a 3 metre or 10 foot gap between infected and non-infected animals. If the aerosol theory is correct and is responsible for at least some of the secondary Ebola infections in Africa, it will be almost impossible to control given how many times daily humans are in contact that is closer than 10 feet, particularly in a hospital or even an urban setting. In case you were hopeful, the study also proved that interferon was ineffective at controlling Ebola.